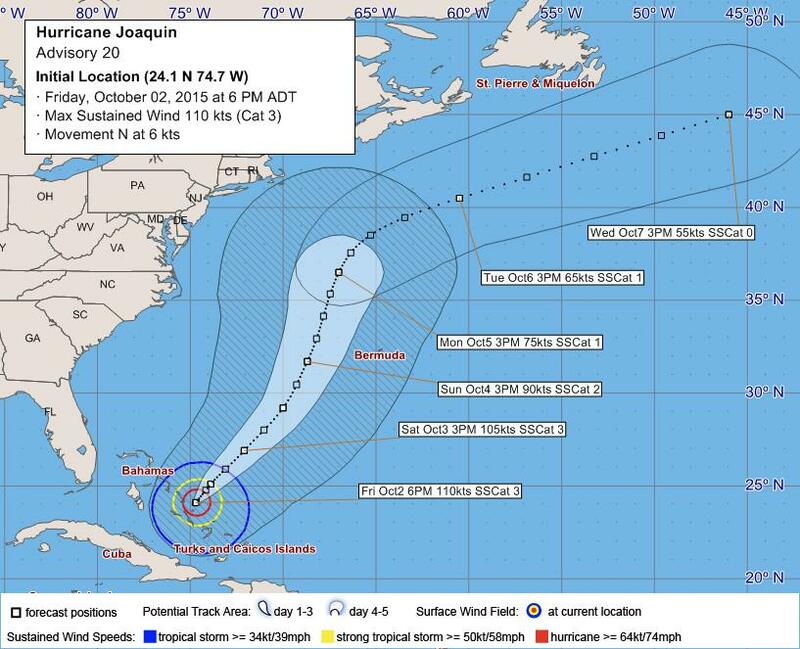 The Royal Bermuda Regiment [RBR] tonight [Oct 2] are gearing up in case Hurricane Joaquin hits the Island on Sunday. Equipment will tomorrow morning be stationed east of the Causeway in case the east end is cut off and up to 120 troops are on 12 hours notice to deploy. Col Foster-Brown added that, if needed, troop deployments would involve Immediate Response Teams on land and on the water and support soldiers like chefs, drivers and signallers. He said: “We take our hurricane preparedness very seriously. “We had the experience of Fay and Gonzalo last October in quick succession and we have refined our response even further as a result of that 10 day deployment. And he said soldiers should follow the messages on http://www.bermudaregiment.bm/ and from their company – particularly if the BWS formally declare a Hurricane Watch. Col Foster-Brown added the Regt had been asked to be prepared to provide up to 17 soldiers to help residential care homes ride out the hurricane if it comes. Thank you BDA regiment, anyone else thinking how silly those sound, that want to disband this very important service we have??? The regiment needs to stay!!!! I agree. The antis don’t deserve ANY help from the very people they slate. But they’ll accept it of course. the regiment is definitely a good thing to keep around..but the fact that young men are forced into service whether they want to or not is archaic and needs to be stopped immediately. do you know what people in the USA and canada think of forced conscription in 2015? they think were backwards and they’re right to think that way. people deserve to have the right to choose whether to enlist or not. Yeah well most of us are obligated to do something every day. It ain’t the end of the world. i hope it hits us in Bermuda…no school baby! Only one of two imbeciles could possible make a post as stupid as yours, the first imbecile, would be a student that has displayed the fact that they cannot afford ANY missed days of school?? Or the other is a teacher that should be ashamed of themselves for making such a stupid statement, which one are you??? If you are a teacher, you have proven the need to have only FORIEGN teachers locally!!!! The odd occasion when I thought I agreed with you, until YOUR STUPID statement regarding foreign teachers! That comment has made you no less of an imbecile that the poster above you..maybe worse. only a fool with no COMMON. SENSE would think of something like that …. Ohhh, wait… You mean that waste of time Regiment we have (sarcasm). Well you won’t want their help or a tarpaulin should your home get hit then will you. Same to anyone who slates the regiment. I agree with Tolerate, put your name and address down so they don’t waste time in helping you! Well if you think that you won’t require their help. Seriously get a life. sam dexter if youre relying on the help of the regiment and no one else i feel for you man. when fabian hit my entire neighbourhood was helping the clean up of the roads, drive ways, even a beach nearby. i didn’t see a single uniform. not that I’m saying that they don’t help, they do. and i believe they do their job very well and should be kept, but what ‘hunger games’ said was absolutely true – have the regiment on a volunteer basis, because he or she is spot on with saying it’s modern slavery. there’s no way the young men of this island should be forced into conscription, its embarrassing to tell people up here in canada that if i were not in school, id be in uniform because id have no other choice. So if you weren’t away at university you’d be expected to do some community service once in a while. Oh my god. That’s barbaric. You’re breaking my heart. community service is hardly the same thing as being forced into a regiment. Slavery is where you are owned by someone 24 hours a day. One night a week and maybe one weekend a month is hardly slavery. Do something for your island. But then again, you’re probably not Bermudian. If I am correct, go home.I will drive you to the airport if you wish. I just want to see you go!